Why Should I Post-Process My Images? 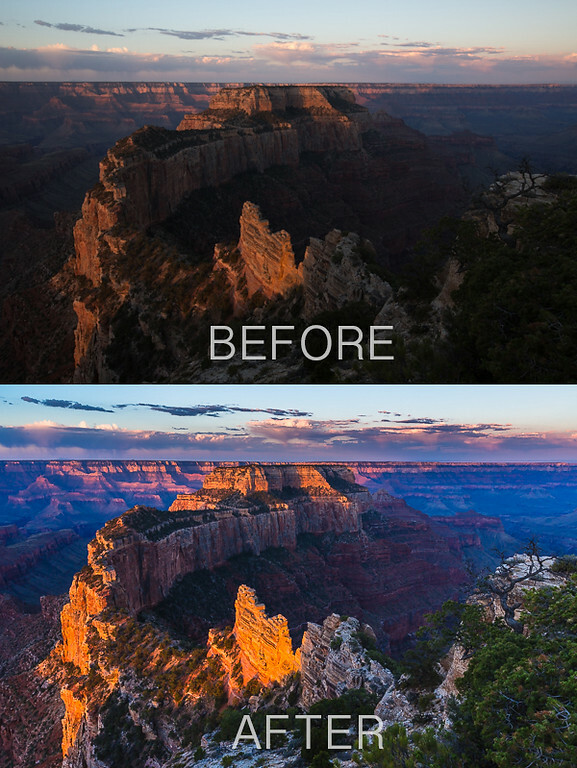 One of the best ways to improve the look and feel of your photography is to use post-processing software to balance tonal levels, add contrast, emphasize color, and sharpen them for web or printing. One of the best tools out there for this is Adobe Lightroom (currently on Version 6, and the creative cloud). Lightroom is an all inclusive editing program that allows you to manage your original image files, make adjustments by intuitively sliding bars back and forth, all while leaving your original files untouched (referred to as non-destructive editing). Lightroom is a RAW file image editor, which means that it can read camera RAW files just as easily as a jpeg files. The difference between RAW and jpeg is significant. I recommend shooting in RAW for its ability to capture important data that can be utilized to bring out the most detail from digital photographs. It is a fact that every digital image is processed to some extent. If you have ethical reservations about making changes to your images please be aware that every digital camera adds a layer of processing to the file before it displays it back to you on the viewfinder. Furthermore, nearly all images you see on the web have been put through a digital editing process (also known as post-processing). The types of editing that I will walk through in this tutorial do not add elements to the original scene, but rather refine the existing ones; in this way the final post-processed image is a true representation of what was photographed. These are the type of adjustments Ansel Adams would make to his images. I can say with utmost confidence that if he were alive today, Ansel Adams would be using these image editing tools to create powerful images. A composite image, which is not discussed in the video, refers to combining images taken at different locations. It is often used to create an image that is untrue to the original scene. Even though composite images are not accurate representations of reality, these images can be work of art. The ethics of such practices is a discussion for another time. In the video I go over the process of assigning rankings to images using the 1-5 stars. This process is a helpful way to narrow down which images are keepers. – The first time through the images (1-star) should be a quick decision using an emotional response to the picture (i.e. you like it, or you don’t). – The second time around (2-star) should be more critical than the first. You are looking closer into the picture quality, composition, elements captured etc. – The third pass (3-star) should be a highly critical approach. You will often need to decide between similar shots at this point. Possibly zooming in and checking which one is focused better. You might even need to start playing with some of the adjustments to move past this stage. – Only assign 4 star ratings to images that want to keep and do some post-processing to. Remember we only want to show our best work, so keep your standards high!